If there is anyone on my gift list who deserves a homemade Christmas gift it is Husband. My guy likes to cook. He likes Doctor Who (because he has excellent taste in science fiction). He also likes to keep his fingers from burning off around the stove. 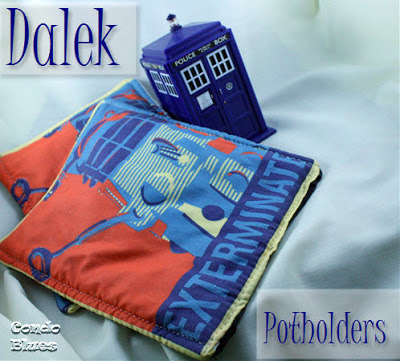 Homemade Dalek potholders? Perfect! Well that and a healthy dose of OMG! OMG! OMG! Dalek fabric! Must-have-Dalek-fabric-must-make-something-from-Dalek-fabric-yikes-it-is-pricey-I’m-not-making-a-dress-ah ha!-I-will-make-potholders-as-a-stocking-stuffer-instead! 1 fat quarter (actually less) of Dalek fabric. I bought the smallest amount of Dalek fabric I could for from Spoonflower. I bought with my own moo-la-la a fat quarter of the design printed on regular cotton fabric for around 10 bucks. Spoonflower is print on demand fabric and I could have chosen an organic fabric but I didn't want to shell out even more since these pot holders will probably go the way of all of our other potholders – burn and stained to Pandoraca come. Old bath towel or fiberfill batting for insulation. I cut two layers from an old bath towel for the heat resistant interior layer of my potholders. It works great, recycles, and is plastic free! Coordinating plain cotton fabric for the back of your potholder. 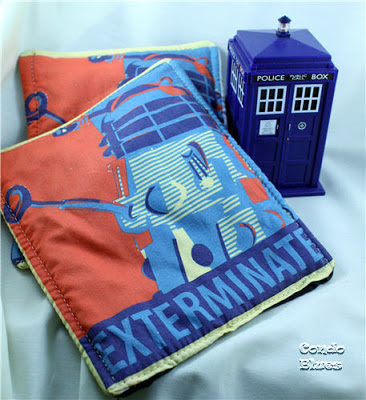 I used what I had in my fabric stash, although you could make your potholders double sided Daleked if you want. Paper rectangle pattern in the size you desire plus one inch for a seam allowance on all sides to make sure you cut the three layers for each potholder the same. 1. 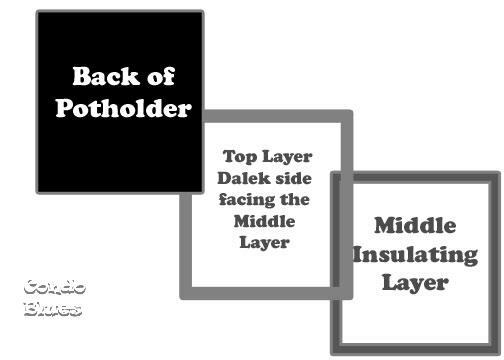 Use the paper pattern to cut 1 layer of Dalek fabric, 1 layer of the insulated layer (my bath towel is thin so I cut two layers of it), and 1 layer of coordinating backing fabric. 2. Make a layer sandwich. Put the Dalek fabric right side (the Exterminaty side) down on top of the middle layer (the towel.) Now put the coordinating fabric on the top of the not pretty design part of the Dalek fabric. 3. Pin all sides of the potholder layers in place except for a small gap on one of the straight sides. 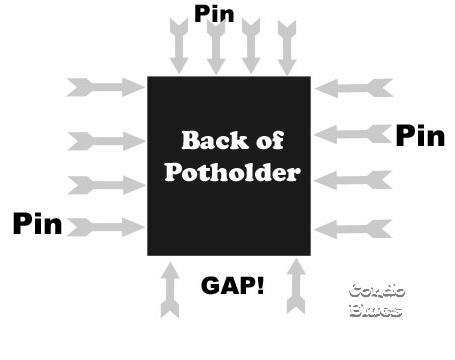 You will use this gap/hole/probably-some-professional-sewing-term-I-don’t know to turn the layers right side out in Step 5. 5. Turn the layers right side out through the gap in the fabric. 6. Turn the raw edges of the gap into the hole and pin into place. 7. 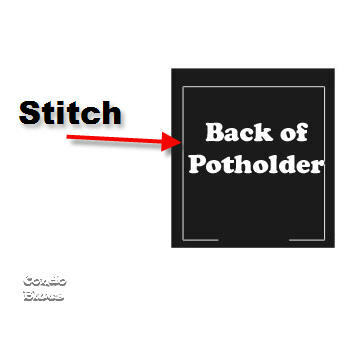 Top stitch around the outside of the potholder. This will sew the turning gap closed, keep the layers from shifting, and looks mighty pretty and a wee bit more professional. 8. Exterminate those kitchen burns with a Dalek potholder! In all true confessions truthiness, ‘cuz I’d never lie to you guys, I’m not blowing any surprises posting this project before Christmas. I made and gave Husband the Dalek potholders last year for Christmas. He likes them. Nice to hear you have a supportive husband. I have one too. So great you gifted him in the very way he supports you. Hi Lisa, I’m Anne from Life on the Funny Farm (http://annesfunnyfarm.blogspot.com), and I’m visiting from Make It Pretty Monday. How awseome is this? Great job. And I love the graphics on your tutorial. Well done! What fun potholders! Thanks for sharing on the homemade holiday party. Just found your blog via the Share it Link Party. Yours was the first I clicked on because well, it's awesome! I'm happy to find a fellow geeky crafter!! I have a few geeky crafts (mainly Star Wars) that I did on my blog. A new flower now, I am (as Yoda would say) and I'll be checking out the rest of your blog. Great stuff!! <3 i love nerd projects. i've eyed that fabric before too, but yeah, I need a plan before I spoonflower something, pricey. looks like fun though! These are great pot holders. I love the fabric. Thanks so much for sharing at Wednesday's Adorned From Above Blog Hop.